Today Momentum has released the results of internal elections for its highest body. A majority of the successful candidates are women and half are Black and Minority Ethnic (BME). Over 13,000 votes were cast – 35 per cent of eligible members – with increased turnout compared to last year. 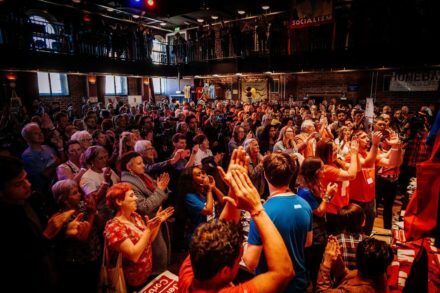 The grassroots campaign group, which grew out of Jeremy Corbyn’s leadership campaign, annually elects representatives of ordinary members, affiliated trade unions and organisations and Labour public office holders to its national co-ordinating group (NCG). The places for affiliated bodies will be held in May, to be followed by the first meeting of the new NCG on June 2nd. In London and the South East, Apsana Begum, Becky Boumelha, Jon Lansman were elected, and Yannis Gourtsoyannis was re-elected. They replace Christine Shawcroft, who recently stepped down from Labour’s national executive committee amidst a row over alleged antisemitism, Sahaya James and Puru Miah. In the Midlands, the East, the West and Wales, Michael Thawe and Natasha Josette were elected, while Martin Menear and Cecile Wright were re-elected. In the North, Scotland and International, Aneesa Akbar and Liz Smith were elected, as Elizabeth Hayden and John Taylor were re-elected. Helen McDonald, Leigh Drennan, who was narrowly defeated by Miriam Mirwitch in the Young Labour chair election last month, Haringay councillors Joseph Ejiofor and Emina Ibrahim were all re-elected.